This year’s 2019 Scandinavian Midsummer Festival reaches a milestone. We will be celebrating our 52nd Anniversary. Would you like to be an integral part of keeping the Scandinavian heritage of the North Coast alive and making this year’s festival extra special? 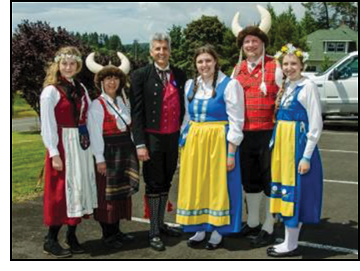 The Astoria Scandinavian Midsummer Festival Association will celebrate 52 years of food, family and fun. We are a volunteer, not for profit association and our mission is to share Scandinavian culture and heritage by promoting and preserving traditional cultural, family and community values for the benefit of future generations. Our hope is to bring a bit of Scandinavia to the Oregon Coast and with your help we can keep the tradition alive. We are a 501(c)3 organization. Your sponsorship will allow the association to continue to promote Scandinavian Culture and Traditions and bring high quality entertainment for the enjoyment of all friends and families. Members receive 4 free admissions, weekend parking, and our official festival hat. Membership is posted on our sponsorship wall at the festival (if received by March 15, 2019) and viewed at the Astoria Scandinavian Midsummer Festival, web sponsorship. Members receive 4 free admissions, weekend parking, 2 free breakfast admissions and our official festival hat. Membership is posted on our sponsorship wall at the festival (if received by March 15, 2019) viewed at the Astoria Scandinavian Midsummer Festival, web sponsorship, and a listing on the Troll Run T-shirts. Members receive 4 free admissions, weekend parking, 2 free dinner admissions and our official festival hat. Your business advertised on the festival poster (if received by March 15, 2019). Membership posted on the sponsorship wall viewed at the 3-day festival, web sponsorship and listing on the Troll Run T-shirts. Members receive 6 free admissions and weekend parking, 4 free breakfast admissions, 4 free dinner admissions and an official midsummer festival sweatshirt. Your business advertised on the festival poster (if received by March 15, 2019). Membership posted on the sponsorship wall viewed at the 3-day festival, web sponsorship and listing on the Troll Run T-shirts. Members receive 8 admissions, weekend parking, 6 free breakfast admissions, 6 free dinner admissions and you will also receive an official festival sweatshirt. Your business advertised on the festival poster (if received by March 15, 2019). Membership posted on the sponsorship wall viewed at the 3-day festival, web sponsorship and listing on the Troll-Run T-shirts. The association would like to continue our traditions and preserve them for future generations. With your help we will be able to do so. The heritage association strives to provide an experience for all ages. Old country feelings run deep here. We would like to take steps now to ensure that future generations will not forget. The heritage association hopes to maintain a stable financial picture. To help us in our quest, we created our fund raising sponsorship to provide financial stability for our organization. Pacific Power, Columbia State Bank, Warrenton Fiber and Nygaard Logging, Columbia Memorial Hospital, Dave & Lorine Hoyer, United Finnish Brotherhood & Sisterhood Lodge #2, Clatsop Community Bank, George Siverson, Sons of Norway Nidaros Lodge #16, Leland Vessel Assistance, Englund Marine, Edith Henningsgaard Miller, Lektro, The Astor Street Opry Company, Finn Ware, Pacific Machine Shop, Sundial Travel, Wadsworths Electric, The Daily Astorian, Tony & Shelly Larsen, Gerry Swenson, Sen. Betsy Johnson and The Astoria Riverwalk Inn.